In beautiful Sarasota, FL, it’s easy to spend the whole afternoon on the boat cruising the glistening waters while simply enjoying the views. Though, there are also the days you may be looking for new activities and ways to enjoy our area by boat. Here are five unique things to do on the water in Sarasota, FL that include more than fishing and cruising—though those activities are just fine with us! Snorkeling in seagrass is a beautiful and exciting way to spend your day on the water in Sarasota, FL. See if you spy spotted seatrout, pinfish or sea turtles having their lunch. Then, you may see majestic ospreys and pelicans while hovering over the water. 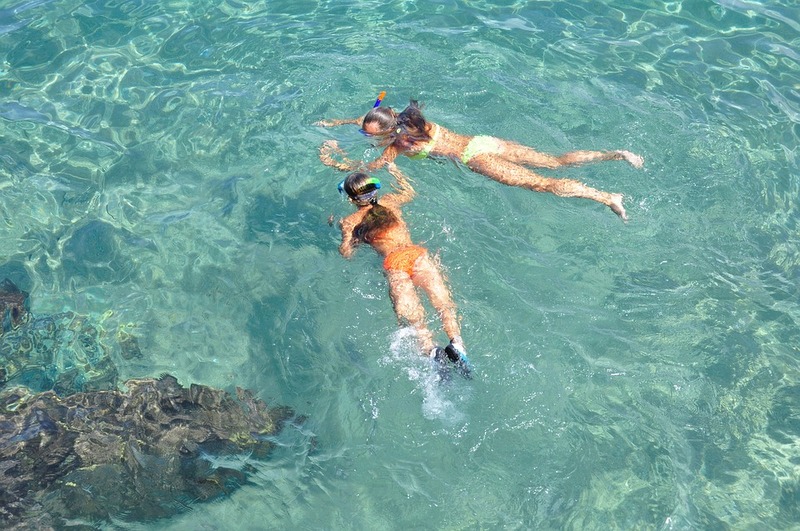 Whatever neat creature you are lucky to spot, snorkeling is a special way to spend your afternoon in Sarasota. Explore the many sandbars nearby. Take your adventures out to the sandbars during low tide where you can see the water from a new perspective. Pull up your boat, park your beach chairs, and hang in the “middle” of the ocean. Sandbars are also a great place for your furry friends to exercise their legs since it’s particularly shallow. Take a luxury home tour. Be amazed at the grandiose homes that are on the water in Sarasota, FL. From gorgeous architecture to ornate guesthouses and boat docks, the homes are always a spectacle to see! Waterfront homes also take it up a notch in terms of lawn art. See a life-sized statue of Michael Jordan or original masterpieces grazing in the yard. Sure, picnics on land are just fine, but when you’re on the water in Sarasota, there are ever-changing backdrops for you to enjoy while dining. Cling your forks to the sunset or sunrise, or you may even get front row seats to a dolphin show! Locate the area’s spoil islands. Spend the afternoon looking for secret spoil islands! Spoil islands were created when the Gulf Intracoastal Waterway was being completed. These dredged areas, or spoil islands, now create an environment for visitors to anchor their boats, swim and explore their surroundings. The spoil islands were formed in all shapes and sizes, so there’s always a new one to explore. On spoil islands, you’ll also see an assortment of interesting creatures from raccoons to salamanders.